SONOSIM SUMMARY: This study in the American Journal of Emergency Medicine aimed to assess the accuracy of point-of-care ultrasound for diagnosing long bone fractures in the setting of trauma. The study took place in two emergency departments, where qualifying injuries were assessed with ultrasound, and then with plain radiographs. Results supported ultrasound as an accurate imaging modality for diagnosing and evaluating long bone fractures. Waterbrook AL, Adhikari S, Stolz U, et. al. 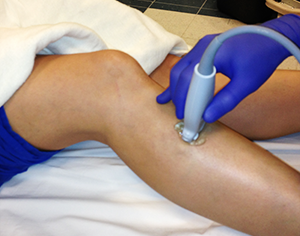 The accuracy of point-of-care ultrasound to diagnose long bone fractures in the ED. Am J Emerg Med. 2013 Jul; 31(9): 1352 – 1356. To determine the diagnostic accuracy of emergency physician performed point-of care ultrasound (POCUS) for detecting long bone fractures compared to standard radiography. This was a single-blinded, prospective observational study of patients presenting to two emergency departments (ED) with trauma to long bones. The study used a convenience sample of patients seen during the study investigators’ scheduled clinical shifts. Patients presenting to the ED with complaints of long bone trauma were included in the study when a study investigator was available in the ED. POCUS examinations of injured long bones were performed using a standard protocol. The investigators documented their interpretation prior to radiographs being performed. After standard radiographs were performed, the final radiology reading by a radiology attending physician was obtained from the medical record. One-hundred six patients were enrolled into the study, and 147 long bone POCUS examinations were performed. Forty-two fractures were present by radiographs and the prevalence of fractures was 29%. The sensitivity was 90.2% (4/41, 95% CI: 76.9-97.3) and specificity was 96.1% (4/102, 95% CI: 90.3-98.9). The positive likelihood ratio was 23.0 (95% CI: 8.8-60.5), and the negative likelihood ratio was 0.102 (95% CI: 0.040, 0.258). The positive predictive value was 90.2% (4/41, 95% CI: 76.9-97.3) and the negative predictive value was 96.1% (4/102, 95% CI: 90.3-98.9). Emergency physicians can accurately evaluate long bone fractures in the ED using POCUS. In particular, long bone fractures can be excluded with a high degree of confidence.